We're here for you six days a week making the prettiest, freshest flower arrangements for your every floral need. Flowers are a welcome part of so many of life's special occasions: birthdays, new babies, get well wishes, thank you gifts, sympathy expressions, anniversaries, play openings, dance recitals, proms, church services, weddings and parties of all kinds. Just about any of life's occasions can be made more beautiful with long-lasting, expertly arranged flowers from Hatler Florist. See the detailed categories below for more information, our ﻿FAQ page﻿ or contact us with specific questions. We offer a large variety of fresh cut flowers daily, usually including Roses (3-5 colors), Miniature Spray Roses, Standard and Miniature Carnations, Daisies, Lilies (Hybrid & Oriental), and Alstroemerias, Snapdragons, Delphiniums, Irises, Belles of Ireland, Sunflowers, Hydrangeas, Gerbera Daisies, Chrysanthemums, Calla Lilies, Liatris and Hypericum berries. If you need a specific item for a special date, let us know and we will do our best to get it for you. Please allow 7-10 days for special orders. We also offer a seasonal variety of beautiful foliages and accent flowers to complete the look for a gorgeous arrangement. Dish gardens are tabletop-size groupings of green house plants in your choice of a wicker basket or ceramic container. We add a stem of cut flowers, seasonal bow and care tag. Prices range from $25.00 to $75.00. Larger single floor size green house plants are priced by pot size and age of the plant. Six inch pots are $30.00. Eight inch pots are $45.00 and ten inch pots range from $60.00 to $100.00. The physical sizes vary depending on the type of plant. Included is a plastic-lined basket, bow and care tag. In blooming plants we offer azaleas, hydrangeas, lilies, chrysanthemums & poinsettias when seasonally available. Prices range from $25.00 to $50.00 for single plants and $75.00 and up for plant groupings in double or triple baskets. Included is a basket pot cover, bow and care tag. Upgrades include seasonal or ceramic pot covers, decorative branches, birds, bird's nests and butterflies. We receive three weekly shipments from licensed Tennessee nurseries. Our plants are fresh and healthy. Common varieties include spathiphylum (peace lilies), ivies, ferns, ficus, dracaenas, philodendrons, pothos, crotons, palms, scheffleras and dieffenbachias. Silk flowers are now called permanent botanicals because they include products made from so many different materials. 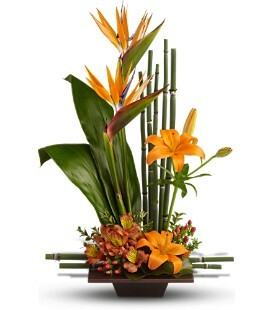 We buy only the best, most realistic flowers and foliages, and have a large everyday and seasonal selection. Our designers create arrangements on site and can consult with you if you need a custom piece in your own container. Please bring pictures, fabric or color samples and measurements if specific sizes are needed. We are open 8:00 am to 5:00 pm Monday through Friday & 8:00 am till noon on Saturday. closed on Sunday, but we do make funeral home deliveries for Sunday visitations and services. Our delivery charges range from $2.00 to $15.00, depending on the distance from our shop. We cannot promise specific times, but will get as close to your request as possible. Please help us by having complete, correct addresses and phone numbers. As a general rule we try to reach recipients by phone before delivery is attempted. We prefer to not leave deliveries on porches unless we are sure we are at the right home or have been instructed to do so. We deliver daily to Cumberland Medical Center, our three local funeral homes, Bilbrey Funeral Home, Crossville Memorial Funeral Home and Crematory and Hood Funeral Home and Crematory; Our seven assisted living and nursing homes: Cumberland Ridge, Life Care Center and Wyndridge in Crossville, Wharton Nursing Home and Fletcher House in Pleasant Hill, and Senior House and Good Samaritans in Fairfield Glade, as well as all local schools, homes and businesses. There is a $2.00 delivery fee to the hospital or funeral homes. Delivery fees vary to the nursing homes, depending on the distance from our shop. Wedding & event consultations are done by appointment and usually require 1-2 hours. We book times between 8:30-10:00 AM or 1:00-3:00 PM, Tuesday through Friday and morning appoint-ments on Saturday. There is a $50.00 consultation fee. Labor charges for doing wedding work vary between 25-50% of the total flower cost, depending on the amount of time involved. We only book one wedding per weekend, so please let us save the date for you as soon as possible. Sorry, we cannot do weddings close to major holidays such as Valentine's Day, Mother's Day or Christmas. Feel free to bring pictures, fabric samples and any ideas you have to help us understand your vision. From the simplest home or outdoor wedding to the grandest church wedding, Hatler Florist is glad to help you choose the flowers you need for your special day. We also offer services for rehearsal dinners and wedding receptions. There are so many options available, from a simple bridal bouquet and boutonniere for the bride and groom, to flowers for a larger wedding party. Please let us know what you are envisioning and we will help you make the best choices possible. You are always welcome to bring in pictures, fabric or color samples, or keepsake pieces you might want worked into an arrangement or bouquet. 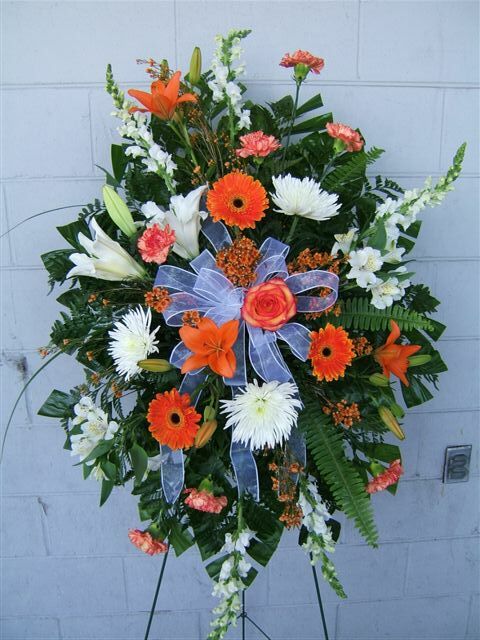 Fresh Funeral Baskets: We do fresh flower funeral baskets starting at $50.00 and up. These are pretty arrangements that will go to the graveside after the visitation and service. Fresh Flower Standing Sprays: We do fresh flower sprays on freestanding easels for a showy, tall funeral design, starting at $75.00 and up. These are intended to be left at the graveside after the service. Casket Sprays start at $200.00 for mixed cut flowers, not including roses. Most casket sprays we do range from $250.00 to $400.00, depending on the size and choice of flowers used. We have pictures available to help you choose the size and look you want. Memorial arrangements for families that have chosen a cremation service are available in many price ranges, from a simple vase or basket arrangement to larger one-sided arrangements to place near a picture or urn. Prices vary depending on size and type of arrangement. Green or blooming plants and dish gardens also make nice gifts from family or friends as a keepsake for a family member to take home and use inside or to plant outside in the yard or garden. There is a $2.00 delivery fee to our local funeral homes. We do vases of one dozen roses arranged long stemmed for $50.00. If you would like a smaller accent bloom added like babies breath, statice or wax flower, the price is $57.50. One half dozen roses can be done for $30.00 with greens only, or $35.00 with accent flowers added. We keep a variety of colors on hand, but if you have a special request for a certain color or variety of rose, please let us know a few days ahead and we will do our best to get them for you. We also do anything from a three rose bud vase at $15.00 with greens only, or with accent flowers added for $17.50, to a vase of two or three dozen roses for those special occasions. Two dozen roses arranged with greens only are $100.00, with accent flowers added the price is $115.00.Three dozen roses with the greens only is $150.00, and with accent flowers added is $165.00. Delivery fees vary, depending on where the order is going, or your vase can be ready for pick up if you would like to deliver the flowers yourself. We keep a wide variety of vases, baskets, pottery and ceramic containers to dress up an arrangement if you would like a keepsake container. We also have seasonal containers and novelties for those special holiday or seasonal looks or the joyous occasion of a new baby in the family. Please call or come by to see what is new today. 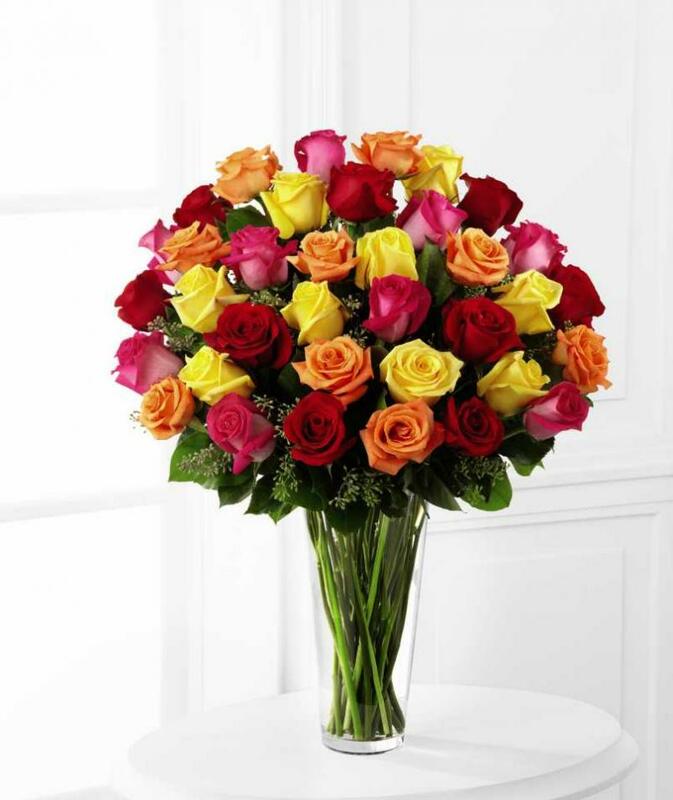 Hatler Florist is affiliated with two wire services: FTD and Teleflora, which allow us to send and receive flowers out of town or out of the country. Prices vary greatly depending on the area and the season. The minimum order for most locations is $35.00-$50.00 plus charges for delivery and order relay. Next day delivery is usually possible, but allow more time (3-5 days) at major holidays. Please be ready with a complete, correct address, phone numbers (home, business and cell) and card message. Both services guarantee your satisfaction, but require notification within ten days if there is a problem. We have selection guides to help you visualize choices of flowers and color combinations; everyday, seasonal and holiday options are shown. Hatler Florist has earned the distinction of being placed in the top 500 or top 1,000 of all FTD florists nationwide (an organization about 22,000 members strong) every year since 1998! Please contact us through our website, call us from anywhere in the world, or stop in the shop to see what all we are currently stocking. We will be happy to help you choose beautiful flowers for any occasion! Find us at 202 Stanley Street in Crossville, Tennessee, and you may reach us by phone during regular business hours at 931-484-5101.